Our district is hosting 6 schools for the Elementary and Intermediate UIL Academic Meet on January 25th from 12:30-5:30. The elementary PTO and the intermediate parent group are working together to set up the hospitality room for coaches, judges, directors, and other staff (approximately 100 people.) Please help if you can. The majority of events are for fourth and fifth grade students. Please see the Sign up Genius link attached. Reaching for the Stars...Believe It to Achieve It! Our District UIL Meet will be on Friday, January 25, 2019 at Lago Vista Elementary. Even though it is an early release day, all Lago Vista Elementary and Intermediate UIL contestants will need to stay at school and not go home at early dismissal. Intermediate students will be bused to the Elementary campus, and all UIL students will be held in the gym and cafeteria until it’s time for their event. Students may bring cell phones, and are also encouraged to bring books, games, hand-held devices, etc. to keep them occupied while they are waiting for their event. There will be Wi-Fi access. There will be a Snack Bar in the cafeteria for students and guests to purchase snack items to eat and drink. If you plan to attend the meet, your child may go home with you when he/she has finished competition. If you will not be attending, please make the appropriate transportation arrangements. There will not be a sign-out sheet for Lago Vista students. Audiences are not allowed in any of the competition rooms. Paper order forms are available in the front office, and they have gone home in Wednesday Folders. Yearbook sales is one of the very few fundraisers that we have at the Intermediate campus. Please help by purchasing a yearbook. We exceeded our goal of 95 books sold last year, and would love to see that happen again! Our goal this year is 100. 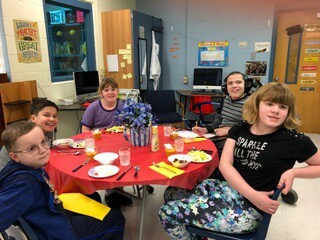 The Chefs in FAC made a delicious lunch to share this Friday. 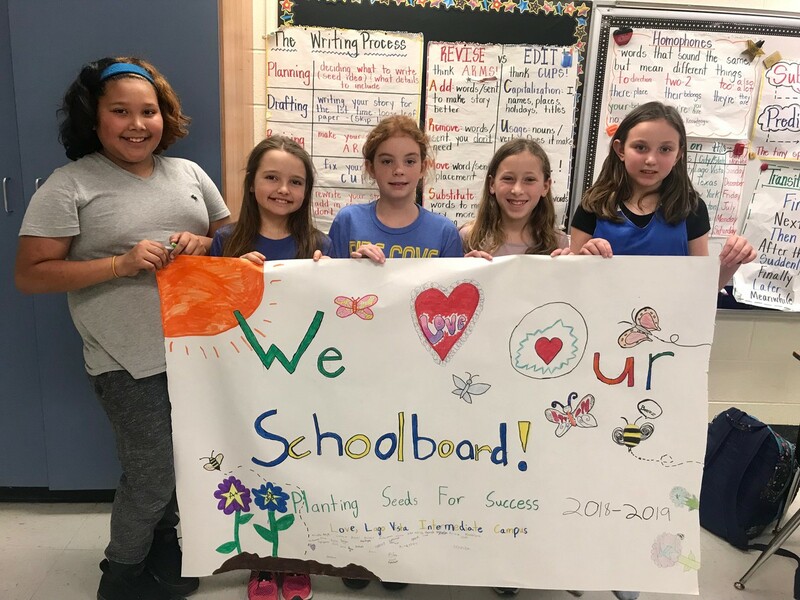 The Intermediate school sends our respect and appreciation for our school board members. They work to help our school best a fantastic place to learn and grow! Thank You! The vast majority of our students with excessive absences fail to pass their classes. Students need to be at school everyday. Our schoolwide attendance goal for this year is 98%. Our state funding is based on the percentage of students at school at 10:00 am every day. Higher attendance rate = more money for resources for your student. 3 or more unexcused absences in a 4 week period - warning letter sent home, phone conference with at-risk coordinator and attendance improvement plan. 5 or more unexcused absences in a 6-week period - warning letter sent home, phone conference with administrator, attendance behavior plan reviewed. 7 or more unexcused absences in an 8-week period - warning letter sent home and Behavior Intervention Plan meeting called with the parents, student, and assistant principal. 10 or more unexcused absences in a 6 month period - truancy charges are filed. Parent, student and school administrator will be summoned to appear in truancy court. Please remember that your student brings home graded work in the Wednesday folder each week. Please review that work and encourage your child to correct and return any work that received a grade below 79. Your child is also schedule a time with his/er teacher to correct tests. assignment. Students may not redo daily grades for which they received a zero. completing or turning it in. 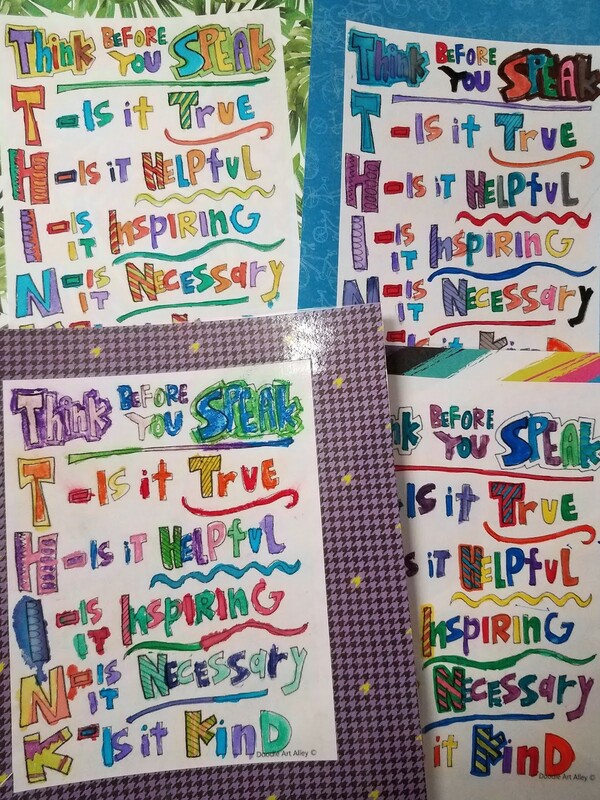 create learners who are able to be effective self-advocates. determine which option is most appropriate for each assignment. 5. A student may earn up to a 79% on their re-do of the assignment. 6. A student may not earn a grade lower than the original grade. Please help us by dressing your child for colder weather. We want our students to be able to enjoy recess outside this time of year. Please be sure that they dress warm enough to be comfortable outside. Having dinner together could change your child's life. Here's why. How can I keep my child safe as he grows up? In January, our class guidance lessons focus on being a good and important part of our family, school and nation. We will be role playing scenarios which help to solidify making positive choices. Please reinforce this important quality as it builds sense of self and service to others and our country. 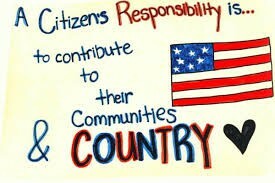 This site contains literature and probing questions to involve your children in thinking about citizenship. At this age, our students are eager to grow in their sense of self and duty to themselves and to others. 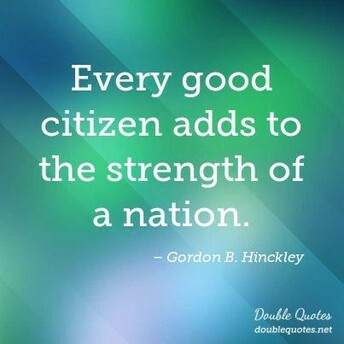 Let’s build on the desire to be a good citizen. We meet each week, on Thursday and Friday. 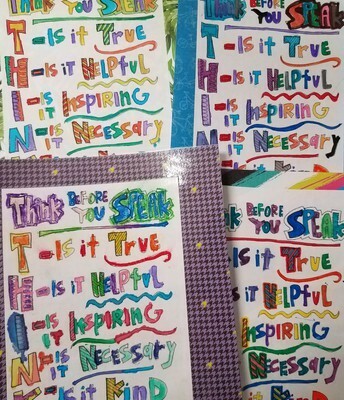 Our current project is to support teachers by decorating positive signs to display and refer to in each class. Stay tuned for our next activity which will be a project in which we collect funds to improve our cafe. We hope to purchase 2 microwaves to alleviate lines in the cafe.